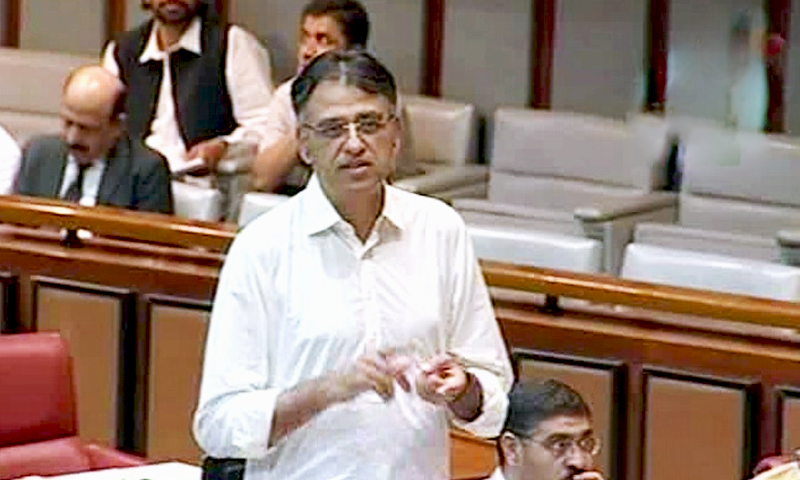 Newly appointed Finance Minister Asad Umar on Friday told the Senate that addressing the deficiencies identified by the Financial Action Task Force (FATF) is in Pakistan's own best interest, and that he views the issue as "more an opportunity than a challenge". In June 2018, the FATF — an international terrorism financing watchdog — had demoted Pakistan to its grey list, putting the country just one step away from its dreaded blacklist, which brings with it international sanctions and economic repercussions among other things. The finance minister, while briefing the Senate over the issue today, alleviated the house's concerns, saying: "We have even been on the grey list twice. It is not like this would suddenly result in trade or banking sanctions for us. But it clearly also is a negative signal, especially for a country that has such a severe current account deficit. So you obviously want to avoid this. "But I go beyond that. If you look closely, FATF or no FATF, the deficiencies need to be addressed in any case. All those things are in Pakistan's own best interest." The FM said that he views the FATF issue as "more an opportunity" to improve the country's financial system, adding that there is no reason the government should not be able to address the watchdog's concerns within the 15-month deadline, which will end in September 2019. Umar further said that "the next FATF quarterly review will take place in Jakarta on September 11 and 12. They have identified 27 deficiencies in three broad categories, the first of which is currency smuggling. The second is the Havala/Hundi businesses and the third is related with potential terror financing of proscribed organisations. "To deal with this, a National Executive Committee has been formed. It is chaired by the finance minister (Umar himself) and it has several national institutions such as the FIA, NAB, SECP, etc. Our own review will take place on September 8 and be completed before the next FATF review. We have already identified the action steps needed [to remove] the 27 deficiencies, and also assigned responsibilities. "If we fulfill their requirements and remove those 27 deficiencies by then, we will be back on the white list," Umar explained. 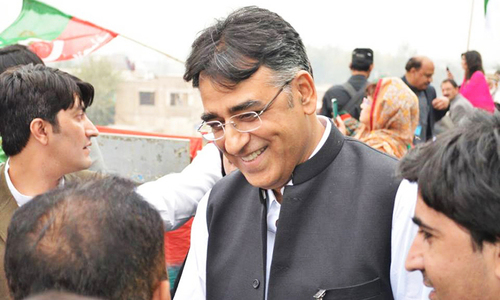 The finance minister, however, described the FATF's demotion of Pakistan from its white list to grey as "exceptional treatment" and expressed reservations against the procedure used by the watchdog. Umar clarified that the Financial Action Task Force (FATF) delegation that visited the country earlier this month was there for a routine evaluation and that their visit was not related to Pakistan's placement on the watchdog's grey list. "It was an FATF delegation but it was here for a separate exercise of mutual evaluation, which is conducted after every four or five years," Umar said. "Even if we were not on the FATF grey list, this delegation would still have come." Regarding the depleted state of the government's coffers, the finance minister informed the Senate that the federal government requires $9 billion to run the country. "The number that we need to borrow, according to the budget, is $9 billion," said the finance minister. "But we are trying to address the root cause that compels us to borrow these $9bn. Of course, we know any measures [we take] will take time — maybe even two or three years — to bear fruit. "In the meantime, whatever gap there is, we are calculating. As soon as our plan gets finalised, which it should within one to two weeks, we will present it before the parliament, and then we will also seek suggestions from the National Assembly and Senate to improve it further." Umar said that the decision to approach the International Monetary Fund (IMF) for loans will be taken after consultations and taking the parliament into confidence. Pakistan will be going to the IMF for the 13th time. 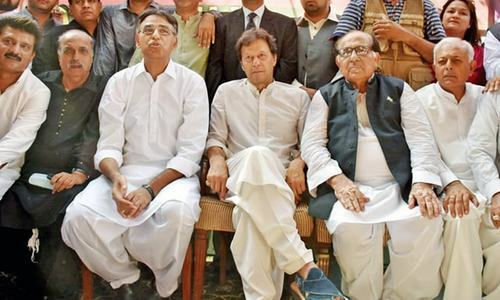 Will PTI’s Asad Umar fare better than past ministers? The only way to handle our financial mess created by Nawaz Sharif and Isaq Dar is to get all looted money back from NS and Asif Zardari. The question is how - the answer is, apply either Saudi or Chinese model quickly, as their is NO other way to ease our problems, and, sooner we do this, it would be better for nation - please do not delay! The dire situation of past mismanagement and poor governance comes to light. Finally a capable man is in charge to fix the financial problems that we have been plagued with since decade! It took Greece eight years. "Greece and several other countries in southern Europe were forced to impose painful austerity measures in return for bailouts." Pakistan has borrowed from both the IMF and China. @Kashif Ali - PTI is new they also need money for themselves. but somehow I believe they are far better than old ones. @Kashif Ali With all due respect, taking 'more loans' is a necessity to keep the economy floating and the government working. This, however, needs to be done with other steps that ensure that the economy is revitalized and there is no need to take such loans in the coming future. However, if you feel that we can do without 'more loans' at present - you are very wrong. We were expecting twelve billion but you say nine billion. Thanks for good accounting. @Kashif Ali If you take a loan and eat it up without investing in something which generates money, then you definitely need another loan to pay off the previous one and survive. And this has been going on since 2008. Thanks to PPP and PMLN. Money laundering might be one issue. The other one might be low gas and electric reserves. Because of this industry and factories produce minimal output and thus pay little tax. On top of that, induvuduals just don't pay their tax. Few honest men like Jehangir Tareen do. This is the core issue. People need to pay their tax. Stop privatising everything. @Kashif Ali, every government leaves the treasury empty at the end of their term. Yes, we will need loans. That is not a surprise estimate. In fact the tv panelists in Pakistan have been for most of times had been stressing this point even before IK govt was sworn in. The Pakistan people always like to live in denial but now for the first time a ruling FM telling the truth. I believe 9 bn is just enough to move the country and put it in motion, the country needs much more than this to make the country run..
@Kashif Ali "More Loans...?" Yes, no tax=more loans. Any objections? They are worried about money stashed in banks abroad. Start from local banks; if all this is not a time wasting drama. For those who are objecting on the governments need to take more loans to bailout, PTI does not have a magic wand to immediately fix the debt ridden disastrous system that the previous governments have left behind. It will take time to clean up this mess, please tune in after 2 years. @Kashif Ali What would you like this government to do, print money in a printing press? @Kashif Ali Why don't you ask the past leaders who put Pakistan in a 'hole'. Why don't you ask them to return the money they looted? Then maybe Pakistan can stay away from the IMF! Last few loans. Thereafter benefits of CPEC will start flowing in. An uphill and trudging task to run a bankrupt economy. Where is Ishaq Dar, the so-called Chattered Accountant par excellence, who publicly said everything was fine with budget and budgeting in the Islamic Republic of Pakistan? More than $200 billion is there in Swiss banks. Bring 10% and Pakistan will have no need for loans. Never got this kind of information from the last government. Good signs ahead. One case can bring back such amount from looted money by PPP and PMLN. Can we get instant justice on laundering and corruption cases and get the money by auctioning the properties of criminals if transferring looted wealth takes longer? This is how the PML - N government has left the country......and it is by design. @Kashif Ali Well if you're feeling generous perhaps you can donate the money needed? Please begin talks to request China to convert the CPEC loans into grants in the right earnest. Well, 9 bn would definitely take some time. In the meantime, we could adopt some stopgap remedial measures. For example, the PM stays in the prime minister house on wekkends (no more helicopter rides). Similarly chief minister could also forego plane rides, and include the other personnel. We can sell that helicopter and the plane along woth the protocol cars for the PM, which apprantely PM does want to sell. These are starters, they don't make 9bn, but, if followed, the rest would come along as well. @Kashif Ali Yes۔ Unfortunately it takes time to turn the economic situation around for a country۔ Think of a simple household that owes a lot of loans. To get out of it, you have to plan short, medium and long term. @Kashif Ali what other option you can think of which can foot in 9 bn quickly? This is the biggest challenge facing Pakistan. My question to Finance Minister is that who wil provide such a huge amount . Weren't these ppl saying that they will get the illegal money from abroad and will not take loans? And now he wants 9bn$ to run country and how many billion $ will be required for the 5million houses to be constructed to create 10million jobs? @Kashif Ali Yes more loans for short term, do you have any suggestions to plug in the requirement? @Kashif Ali You have a better idea? Govt. changed but policy remains the same loan, loan and more loan!!! Sir, we can have more than 9B if you can support local IT startups and give them chance to showcase their products worldwide and then you can have Billions. Starting off with a loan of more than 1100 Billion rupees. We just got another Dar. Way to go!! Mr. Asad seems a capable person and one should give him time to address the huge deficit in the budget. In last governments they take loan from IMF immediately. Now in new Pakistan, first they will look and analyse the situation and then take loan from IMF. He is talking about PKR 108000 crore or about PKR 5000 for each citizen of Pakistan. After criticizing loans for over a decade, here you go. You should have studied economic condition before criticizing previous governments. Only nine billion dollars? Who is in the line to give the same to our country? Sadly Pakistan and PTI are dealing with the fruits of the Sharif/Zardari magic money tree. @Kashif Ali - this was due to the policies of the previous government. This loan needs to run pak according to budget of previous govt. It is the gift of PMLN to PTI. Don't worry next years will count on PTI. Number of loans are increasing everyday. @Kashif Ali it's gift of PMLN to PTI. Plz read the news in details. Please ask IK to ask the nation how much he needs from each person. We will do it together! @Kashif Ali whats the other option? @Anti-Corruption_Pakistani Well said! I agree. Only $ 9 billion? This much amount can easily be collected from the sale of a few vacant plots of Blue area, Islamabad. @Hassan (Karachi) But those every government is corrupt! Govt needs to announce 10% rebate on all remittances for a period of 3 months. State Bank will credit rebate in beneficiary account. Overseas Pakistanis could even avail loans from bank to send money to Pakistan for investment. Pakistan can receive additional $5 to 7 billion in remittances that will reduce pressure on external a/c. @Anti-Corruption_Pakistani getting looted money is not that easy. First pakistan has to arrange money for daily requirement. No body is telling the nation that unless foreign direct investment comes, we can not change our economy from a rent seeking economy to a self sustainable economy. No body is telling that foreign investments come when we have a fair political system, political stability, security, advanced infrastructure and a dynamic society which is tolerant. Pakistan is seriously lagging in all fronts. Read what global media reported about us in last 3 months! @M. Speed its $9 billion = Rs 1120 billion. Which plots can fetch us more than one trillion rupees? Some people have very unreasonable expectations here. The new government is still finding its feet. It is not even two weeks and you expect them to make wholesale policy changes in such a short period of time. Give them time to set their economic and other policies. Be realistic please. Taking more loans reminds the famous story of an efficient official. who said. "Dig a pit to dump and cover all refuse". But, what to do with the material excavated? "Dig another pit for it". A new budget will be a sensible move and plugging the illegal transfer of money is urgently needed. $9Billion Mr Umer? Just ask your uniformed friends for it. The sons of senior Generals and some senior Generals themselves could surely cover this without any problems right now. You can go after the rest of the people in the Panama leaks later. @Asad And even bigger eye opener to PMLN supporters who actually thought PMLN had resolved all financial problems. Wake up PTI supporter, their approach is no different than zardari or nawaz, if more loan were unacceptable in previous regime then whats the difference now? The nuclear superpower needs 9 Billion loan to run the country !! Shameful. Nothing new. IMF will be approached again. What is more important is to know what happened to the garguantan loans obtained before? Is there something on the ground to show for it or were they used to pay off earlier loans? If they were so utilised then a day of reckoning will arrive sooner or later . Everybody is blaming the previous governments without addressing the core issue. The government's reflect the citizens. The moment you stop encouraging the army in it's mischiefs, foreign companies will invest which generate employment and income. If you continue to be a rogue state, nobody will bail you out. A sensible address by Mr. Umar Assad. If one happens to go to Kashmir, in certain places, every other shop is a money exchange one. Millions live abroad, and then we wonder why Pakistan is always short on foreign currency reserves. Roughly the same number of Pakistanis live abroad as Indians, yet Indian repatriation of currency is 3 times higher despite the fact that Pakistanis normally have a stronger bond with their mother country. Money exchange shops and Hundi system is the reason for this imbalance. There is no seriousness among our politicians about looming axe. PTI got burdens of billions in dowry. Thanks to PMLN and PPP!! Public expecting relief in first 100 days was a lofty promise, we might see some progress after a year or so. Shame that we have to get the loan just to pay the interest on loans.Makes you wonder how we built all those Megaprojects like Orange Line! 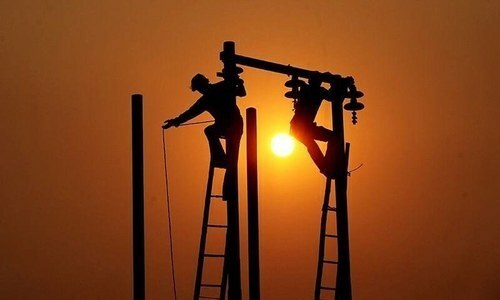 I am well wisher of PTI.... but it seems that they are and will keep all of us in black shadow as PML-N that they would overcome the issue of electricity within a year....and that year has not finished yet...... !! Fortunately one of the few presentable faces in PTI cabinet. for a quick solution govt can issue long term bond for that amount. PTI is now realizing that the state of Pakistan cannot be run without taking loans. Moral of the story is, don't criticize somebody without knowing ground reality. @Irfan Shah so if your suggestion is followed, can it produce $9 billion in next 2 or 3 weeks? @Anti-Corruption_Pakistani Nawaz & Zardari should be punished for their corruption. But bringing their money should make no difference to economy. what percentage of GDP they syphoned ? Individual political corruption effects economy indirectly not the money they syphoned. Really if Pakistan was in such a poor financial position,please investigate all our past luxurious purchases like import of Mercedes/ BMW cars for PM house and recover the losses from the concerned who gave the order. @Atif $200 billion? Where did you get this figure. Borrowing more to pay down the existing loans? This is the silliest suggestion. Revamp the existing taxation system, install safeguards to ensure every Pakistan pays the appropriate corporate and personal income tax with honesty. The only sensible way to reduce either personal loans or country loans is to increase income and reduce expenses. This is no brainer. Increase production, export more, consume less, stop corruption, enforce strict banking and financial systems to prevent money laundering, and enact new practical and progressive legislations. If the PTI talks about "Pakistan First", then its time to govern with honesty and dignity at all level with a Watch Dog to oversee enforceability and transparency. Otherwise everything is just "bakwas" - nonsensical talk. Stop the blame game now and get to work. @Atif My dear man, it is NOT $200 billion but just Rs 200 billion (or $1.8 billion). You are mixed up between Rs (the ever falling) and the mighty Dollar. Even to bring THAT back it will take years. India tried under Modi and so far not much happened and India has bigger clout than we in financial markets. China has a huge surplus of cash but why Pakistan is not asking them. Other very simple and easy solution is to lease Gwadar/Karachi port to China. This way the profits from CPEC will also be guaranteed. Pass law that how much loan can be taken? Why Nawaz was allowed and why China gave huge loan to fund projects- Red line etc, which Pakistan cannot afford. Why China is not bailing Pakistan? Shariff brothers are responsible. At least the Finance Minister is sane enough to realize that the complaints of the FATF are genuine and it is in Pakistan's interest to meet them and eliminate them. That's a Good Start. Thank you Asad for telling the truth. Pakistan has been run into the ground by Nawaz and Zardari. PTI now has to come up with ways to survive this financial ,crisis. I would however like to add that for future governments Pakistan needs to have some rules. You cannot go to IMF or world bank for loans. You cannot mismanage the economy and put the burden on the new govt. Start accountability of previous governments. Break the yoke of feudal system. Shakedown the Dons. Naya Pakistan needs action. @Asad I am appalled by your ignorance. What does this has to do with PTI? This should be an eye opener for PPP and PML supporters. But will the establishment let the government address these concerns with no interference? The Minister has a very sensible approach , people of Pakistan should support him. most are dreaming about getting untold billions brought back to Pakistan and every one will live happily ever after!!! I am worried about China loans than any other loan. Pakistan should try to avoid to go to IMF. Use Saudi Model and get the money back from looters/money launderers. I see a marked change in approach of this new government. Its matured and focused. Addressing FATF's concerns will be total reversal of policy, followed by previous Governments and public unrest. @Kashif Ali No one will give loans to the one on a grey list. There is no need to take loans from IMF or any other country for Pakistan. Pakistan need to improve it's relations with India and Afghanistan. if they had best interests; they would step down themselves. Perhaps resetting the price of land given at concessional rates in Bani Gala and elsewhere in Islamabad to the inhabitants of the same and charging them the differential price would bring in the desired amount of nine billion dollars required to run the country's affairs? in short the only way out of this crises to bring back the money are in foreign banks , looted by the politicians. to materialized his claim IK needs to take hard decisions, good relations with the nabour countries and trade with them to boost the economy. No matter who is in power, the financial burden will not be fixed. We all know in our hearts the current share of defense budget for the economy and population of this size is un healthy nad unsustainable. Please give statehood and full representation in the national assembly to Gilgit-Baltistan. It will always remain an important part of Pakistan, it’s people love Pakistan and deserve representation in NA. Every economy remain strong on 4 pillars. 1, Maximum industrialization 2, More exports than important. 3, Foreign direct/indirect investment, like CPEC. 4, Giant service sector - Banking, Insurance, IT, Tourism. These all need, sound policy, good governance, infrastructure, peaceful atmosphere, political stability etc. So to blame only, corruption do not justify. During second term of Dr.Manmohan govt. corrupt ministers made crores of rupees but it didn't affect too much Indian economic growth. Have said it before and will say it again. 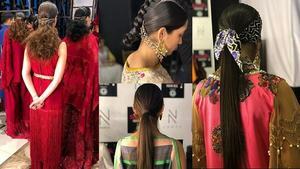 PTI will bring cosmetic changes. Pakistan needs real change. @Asad "should be eye opener to PTI supporters" Yeah! We should bring back Ishaq Dar. Because he is the only person in Pakistan who can save us from this crisis. As according to him Pakistan's financial situation is completely stable. We deserve to have him in the office instead of Asad Umer. Inexperienced and unpractical people in the Govt; will take much time to understand, manage and control things. Pakistani seems to have not learnt anything from Kejriwal in India, dharna politics, blame game and rhetoric dont work. Imran is no different from Kejriwal and is a product of the same circumstances. Kejriwal crated a mess in delhi and now Imran will make mess in Pakistan..